Today is Babywise Friendly Blog Network day! I posted over on Elaine's blog about how Nova slept through the night. The process with her looked very different than with Duke, so I wanted to map out how that worked for us. Read the entire post here! Emily has posted here and has some great things to share on having multiple children and managing the schedules that come with it. She offers some really helpful insight and words of encouragement. Enjoy! I will never forget what it was like when my first baby was born. How overwhelming everything seemed and how lost I felt. Then I read Babywise for the first time. I had clarity and a focus and decided to implement a sleep routine for our home. It was tough, at first, to get everything figured out. It was tricky to stay consistent and to keep my baby on that set schedule. It was hard work but it was work that was worthwhile. Then I added a second child...and now a third one into the mix. Staying on schedule with one child was tricky...but with three?!?! Many people assume as I add more children to my family that I will "give up on that Babywise stuff." That I will decide it's too hard to keep them on all their schedules and I will just go with the flow and not worry about set naps and feeding times. This couldn't be further from what has actually happened. 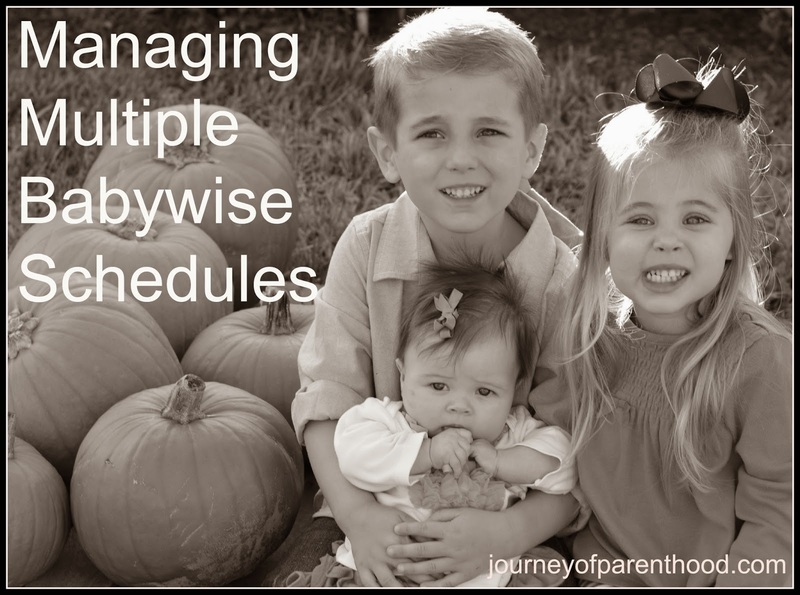 As I've added more children to my home, I've only seen more benefits of Babywise and have only become more consistent in keeping my baby on a schedule. Having multiple children means multiple schedules. However, it's only for a short time period. Once I start implementing a schedule (when the baby is 2 weeks old) all my kids start the day at the same time. The baby nurses at 7:00 and the older two wake up and start the day at 7:00. Now that my third baby is 5 months old she has her afternoon nap at 1:00. Which is the same time my 3 year old naps and my 5 year old naps (using the term "napping" loosely here for the 5 year old...he mostly just rests and reads during this time). Once the baby turns a year old they have their mealtimes with the rest of the family so even that becomes easier! Really keeping all my children on their schedules isn't as tricky as people assume. Usually the days run smoothly for us all at this point! So much of implementing Babywise is remembering that it's only for a season. The early days are tough with a newborn but they get easier. And when you have multiple children, the days of their schedules not matching up are also numbered. For me personally, it's the hardest to deal with all of the schedules when the baby is under two weeks old and not on any type of schedule at all. Feeding on demand is the most stressful time for me. I'm not able to plan the day and I'm not able to know that I will be available to help my older children for their scheduled activities. For example, I may need to make their lunch but can't because baby is nursing. It may be time for them to go bed but I can't tuck them in because baby is nursing. Thankfully, I've been blessed to have help during the early newborn stage! I have my helpers (my mother in law and my husband are amazing!) take care of the older children so I'm able to focus on taking care of myself and the baby. The best piece of advice I always give to Babywise moms who are expecting their second child is to keep the focus on the baby. I know it's hard because you worry about the older child's feelings. You want to keep things as normal for them as possible and you want to make sure they still feel special etc. I have three children and have yet to deal with any jealously issues when I've introduced a new sibling to our home. Yes, I focus on the baby. But that doesn't mean I neglect the other children. Having special time with their daddy and grandmother is a treat (and it allows me to focus on the baby)! They get to watch many more movies when a new baby is at home (when I'm nursing and need something for them to do!). They get a little "spoiling" by getting to stay up late sometimes (when I'm nursing and can't put them to bed on time). And they still get a TON of one-on-one time with Mommy. Babies sleep...a LOT and when the baby is sleeping it allows for that time to spend with the older children. In order of importance, the baby needs to come first when it comes to scheduling. For example: All of my kids nap at 1:00. It's the most important for the infant to be put down for nap at the exact right time so I don't miss the sleepy window! So I put her to bed first. Then I tuck in the 3 year old as her nap is still critical for her to have a happy attitude the rest of the day. Lastly, I tuck in the 5 year old. He doesn't even really need the sleep and it's fine if he goes down late for nap. Same with bedtime. If the older kids stay up a little late in order to accommodate the baby, it's fine. They are old enough to be flexible and can adjust. Even meal times are also easily flexible for them. If my husband is gone at work and I have to nurse the baby at 7:00 in the morning then I go ahead and wake the big kids up earlier and have their breakfast ready for them to eat while I'm nursing. By keeping the focus on the baby's needs during their first year of life it allows for more enjoyment for us all. I know it seems like a big sacrifice that my children spend a lot of time at home while the baby naps. But it pays off so quickly. While I'm pregnant I try to get them gifts during holiday seasons that include fun things to enjoy at home once the baby arrives. I try my best to have a variety of activities for us to do while the baby is napping. By putting the baby first and staying consistent with the baby's schedule, I then have a baby who sleeps WELL. And a good sleeping baby allows for that quality time with my other children. It also means when the baby is awake that she is happy and content and we are able to go and do things during her awake times (once they are long enough to actually go out!) and she will be easy to take care of which also allows for more fun for the entire family. Babies' schedules change often. I physically write out the baby's schedule as well as the schedules of the older children. I then match them up and rework things as needed. Meal times may change for awhile for the older kids. Sometimes our family dinner may have to happen at 5:00 because I will have to nurse the baby at 5:30. Then the schedule will change and the older kids may have to take their baths prior to dinner because I will have to be nursing the baby at 6:30. My children have had no issues with these temporary changes in their schedules and they easily go back to our normal routine once the baby is older enough where the schedules match up better. (P.S. If you’d like to know how CIO is done correctly and in a beneficial way, email me and I’d love to discuss it!) Please any tips are helpful! On baby #2 and just want to feel better about it and less guilty! Thanks! Love your blog! Hey! Thanks for the comment! 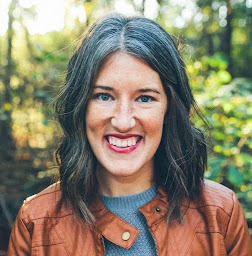 Emily, a blog friend of mine, wrote this guest post. :) But I'd love to tell you how we do CIO in our home with our kids if you need tips. Email me at mydevising(at)gmail.com if you'd like!